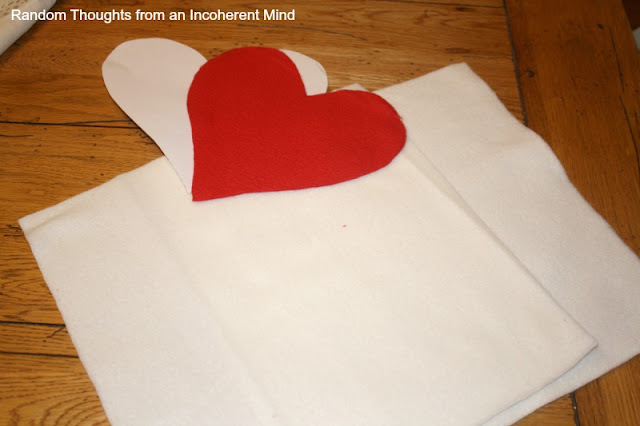 that I also need to make a Valentine's Day pillow to go with them. "Are you planning to make a pillow for every month?" " You're getting ridiculous with the pillows." 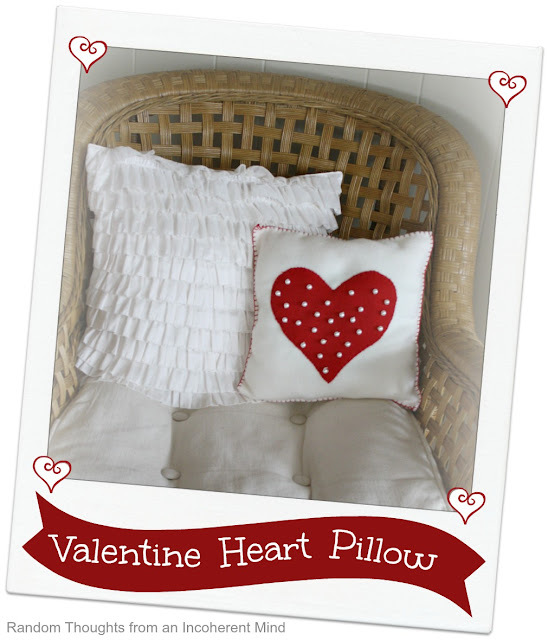 I made that Valentine pillow anyway. just who he thought he was to stifle my creativity. and made a heart template. Despite my best intentions, I never really have a set plan. Then I sewed the whole thing together by hand. I think it's cute anyway. Only a few days left until the big day of love! I love your pillow. I think a pillow a month would be a great idea. And for those of us that are losing track of time, it would be a tangible reminder of what month we're in! LOL!! Very cute!! Love the detail with the pearls!! Your husband and mine sound like they are of the same mind. He has started just rolling his eyes at my decorating antics. He just hates it when I put buttons on pillows. 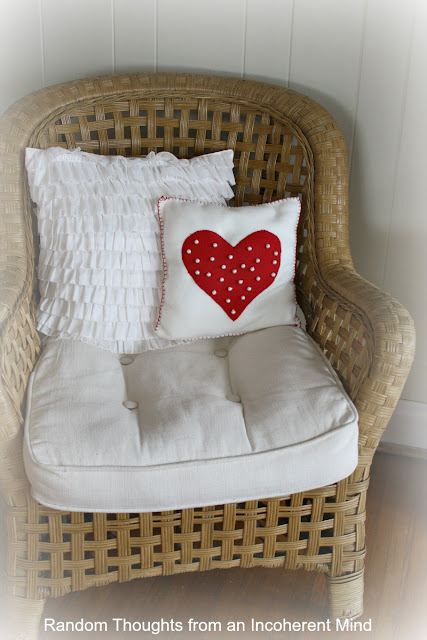 I love the pillow especially with the pearls added to it....They give it the special touch! So cute! That's adorable Gina! You did a great job sewing it by hand also, your stitches are so even! 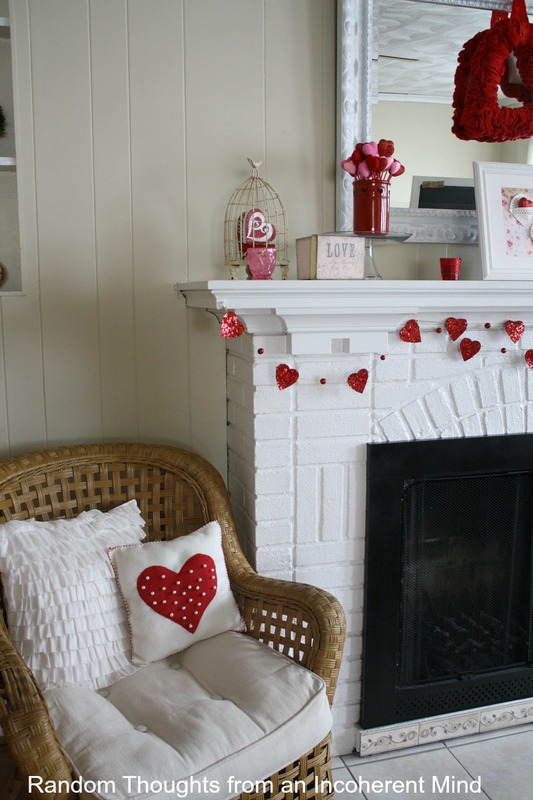 I love it, love the story, have the same reactions to my monthly festivities decor around here - and look at that last photo - how beautifully is ties in with your mantle design. It is very cute. I love the pillows! Oh those hubbys...gotta love em! So cute Gina love how it goes so well with your mantel! What is wrong with a pillow for every month? There's bound to be something you can use for a theme or saying! Your pillow is awesome Gina, great job putting it together. I'd take it off your hands in a "heart beat". The pearls are perfect on it. If it wasn't so close to V day I'd make one also. That is the picture of sweetness! I love the pearls sewn onto the heart. If I could guarantee that my pretty pillows wouldn't be used to cushion someone's seat, I'd be more inclined to make them to go with the holidays too. You keep right on making those adorable pillows, Gina. 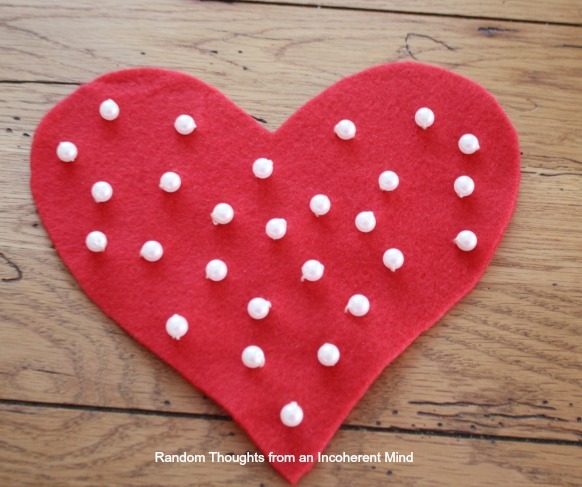 Have a lovely Valentine's Day! I love it!! Red is my favorite color and this idea could be used with many designs. 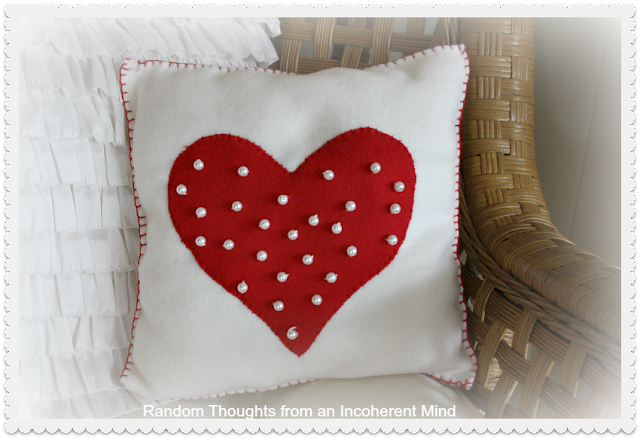 *thinking here* :) Love all your red decor too! Very sweet pillow. The pillows are so fun and you can change them up. Gina that is adorable, really pretty. You just go ahead and make as many pillows as you want! Gina... This is adorable! I think the pearls were just the right touch. Love it! Very cute, Gina! Love the pearls you added to the heart! I love that you added the pearls! You can never have too many pillows! I agree with Janet...a girl can never have enough pillows...MEN! Hee, Hee, Hee. Love your cute little pillow. Tomorrow's the big day :-) Wishing you a wonderful Valentine's Day my friend. Gina, this pillow is just beautiful! You always have the best ideas. I had to admire your hand stitching. It looks perfect! Happy Valentine's Day! Very pretty. I love the details. It is perfect. I missed your pillow post while my computer was down. Really cute. I like the white ruffled one too.